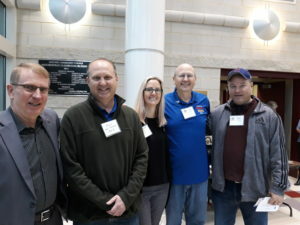 On Saturday, March 7th an RLI event was held at Mitchell Community College in Moorseville. Eager to take advantage of RLI’s 443 incentive rebate, Huntersville Happy Hour Club sent FIVE participants to the Rotary Leadership Institute in Mooresville. The 443 program provides that if 4 Club members register and attend an event, the tuitioon is reduced from 4 to 3. N.C. From left, President Walter Siegenthaler, now an RLI graduate, President Elect Mike Fitzgerald, Cori Stuart, Paul DeBellis, Robert Gors. Honorable mention to Top of the Lake Mooresville Club for sending 4 participants! Lastly, kudos to Felicia Atkinson, whose car was hit by a deer on her way to her graduating class! She soldiered on to graduate at Mooresville !